After using my Avenger learning packet with my kids I realized that my daughter was even more into it then my son. So I thought it would be fun to create one with her in mind this time around. 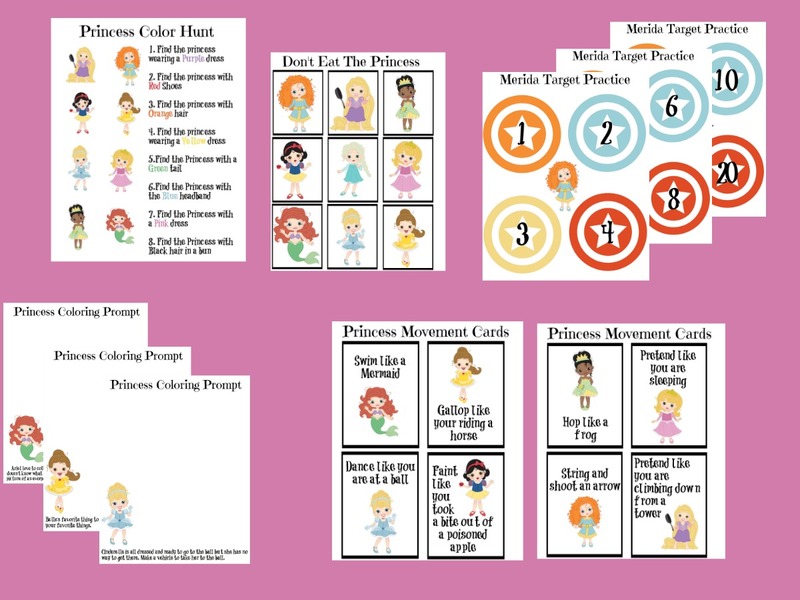 This princess packet includes many fun learning activities, games, and exercises that your little princess will be sure to love. Here is a look at what is included in this packet. 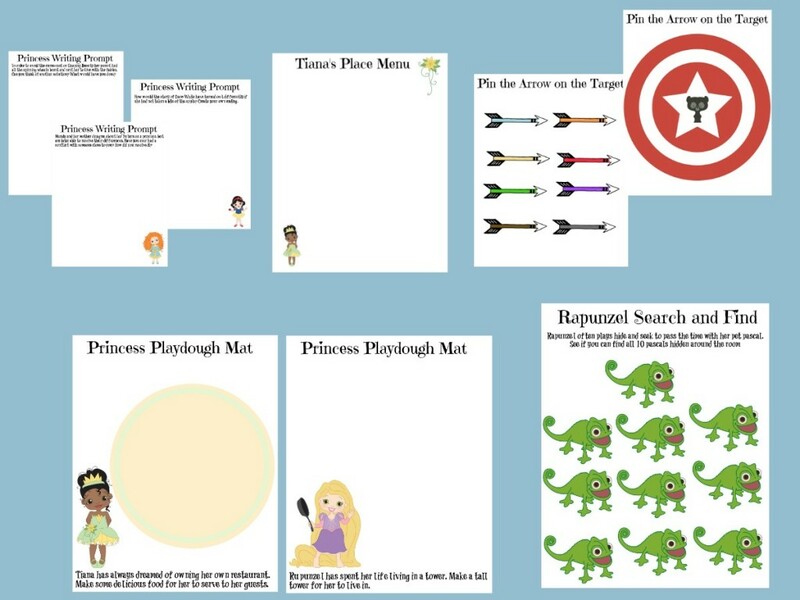 Cut out the Princess boxes on pages 4 and 5 and tape them around the room. 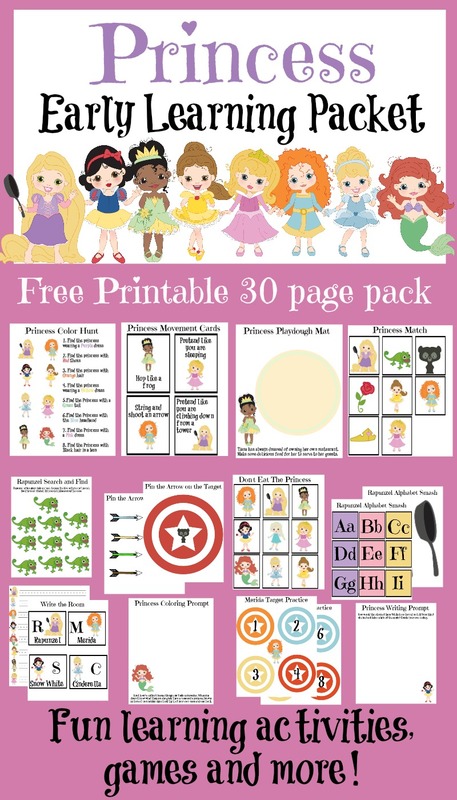 Give the child a copy of page 1 and have them copy the name of the princess or the first letter of their name on the line next to their picture. Cut out the boxes. Have Children match the object to the princess it corresponds to. Cut out the Alphabet tiles and lay them out face up. Call out a letter. When the child locates the letter have them slap the letter card with their frying pan. My son loved this activity in the superhero pack. 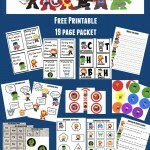 It’s a great way to help kids learn their alphabet while having fun! Place a small treat on each princess. Have one child leave the room. While they are gone secretly choose a princess. When the child returns they will start taking the treats off the princesses one by one. They can continue to take the treats until they take it off the secret princess. When they do everyone yells ” Don’t Eat The Princess”, and that child’s turn is over. Set the targets up somewhere safe. Using soft balls, bean bags or Nerf guns have your Child try and hit the targets. Have younger kids call out the number on the target as they hit it. Older kids can keep track of all the numbers they hit on a piece of paper and add up the number at the end. This was my daughters favorite game. Las time we played we got up into the 100’s. We bought her a Nerf bow and arrow for Christmas this year so I think it will be an extra fun challenge to have her try and shoot them like Merida would. 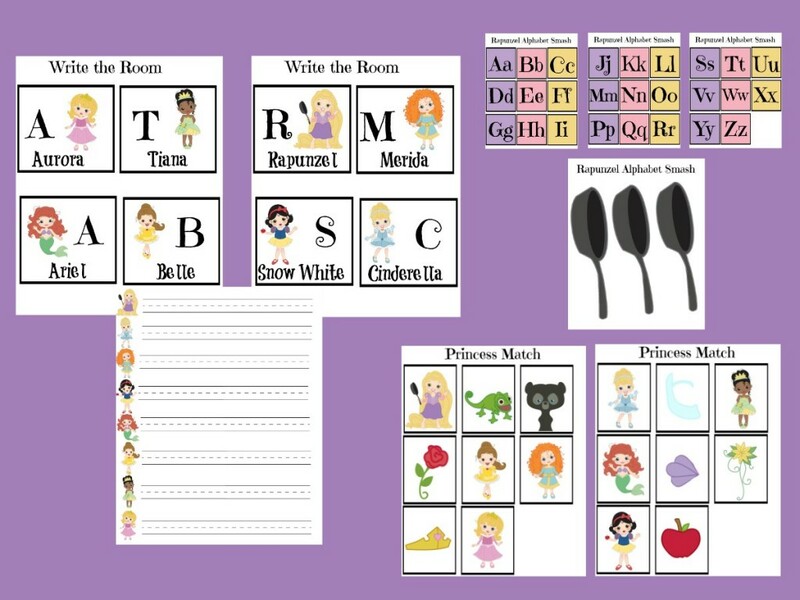 Read the clues and have the child locate the correct princess. Once they find her they can circle her using the correct color. Read children the prompt and have them color a picture to match. Cut out the cards. Have kids pick a card and perform the movement on it. Continue until all cards have been used. Print and laminate the mat. Use play dough to build on the mats. Tape the target on the wall. Blindfold kids and have them take turns trying to pin the arrow on the center of the bulls eye. Read kids the prompt and have them write a response. For younger kids you could do this orally instead or have them illustrate and picture and tell you about it. Let Children create their own restaurant menu and use it for imaginative play. 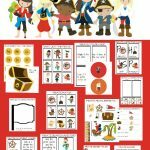 Older kids could add prices to the menu to practice addition skills and their customers order. Hide the Pascals around the room. Have children search for and count as they find all of the ten hidden Pascals. 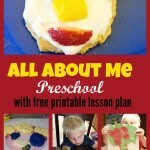 I hope that you will be able to enjoy these fun activities with your children! Please feel free to download the packet bellow. If you have any suggestions on how to improve the pack I would love to hear. Enjoy! I might not be a stay at home mom nor be talking/writing english on daily basis but with two kids that has to learn their ABC and 123 this looks like fun to do in weekends. Thank you for sharing. Thanks Annette I hope your kids enjoy it!